Want the perfect glow this summer? My guest blogger Jennifer has tips on how to make your skin achieve the healthy, luminous and radiant look. Hello everyone! I’m Jennifer, the Anglo-Korean fresh cut flower hoarder from Barely There Beauty. I get asked a lot how I get my skin looking luminous and radiant, and I’m finding that my answers are becoming ever more Korean beauty orientated. ‘Gwang’ or ‘Mul-gwang’ is a Korean term for gorgeously dewy, healthy, luminous, light-beam skin, so today, I thought I’d share some of my favourite tips and products for achieving that much coveted look. 1. It starts with skincare. This may seem like the most obvious point but the end goal here is for your makeup-less skin to be radiant and luminous, and this is a full time job! Whilst the steps below will give you a temporary brightening effect, treat your skin around the clock to gentle brightening treatments to enliven your complexion in the longer term. The list of products you could try is vast but I wholeheartedly recommend the Innisfree Vitamin C sheet masks in particular, that brighten and reduce hyperpigmentation – I use these as often as I can! For the speediest treatment in the world, try the citrus Blithe Splash Mask (full review here) – a 15 second face mask that really works. Gentle exfoliation is really important too, to aid with skin turnover and reveal fresh new layers of skin. I generally steer clear of manual or physical exfoliants in favour of fruit acids and chemical exfoliators, such as the Skin & Lab Gently Vita exfoliator (review) which has an amazing list of ingredients. Plump skin is beautiful skin and keeping my skin hydrated has become an obsession for me! After you’ve used acids and Vitamin C, as mentioned above, it’s important to soothe and hydrate your skin to fill it out, make it look taut and plump and replenish as much water as you can. Look for ingredients like hyaluronic acid, glycerin, collagen, sugar, tremella mushroom or aloe. I’ve been using the Ciracle Hydra B5 Source since featuring it in this post and it’s uber hydrating, it’s a great accompaniment for Vitamin C products. 3. Use a pink tinted sunscreen. 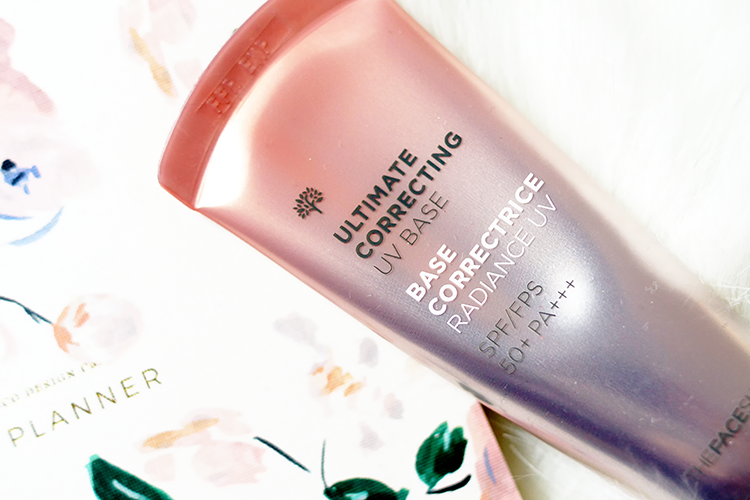 A really subtle pale pink hue in your sunscreen does wonders for brightening up your complexion – it’s like the Korean version of colour correcting. One of my favourites is the Face Blur from Etude House, a multi-tasking product that blurs, primes, brightens and protects with SPF 33. The Face Shop also have their UV Correcting Base which would be more suitable for those with a very fair skin tone that wants brightening, as it has a very luminous finish that’s almost a pale lavender in tone. 4. Try a smoothing primer. As smooth surfaces reflect more light than rough ones, trying a primer that evens out your skin’s texture and creates as glassy a finish as possible, makes your complexion appear a whole lot more radiant. If you haven’t heard of the J One Jelly Pack, you need to scoot on down and read my full review straight away! It’s rather taken the Kbeauty connoisseur by storm for it’s makeup-adhering, plumping and brightening effects. I’ve absolutely fallen in love with the cushion foundation. Everything about them, from the formulation, portability, to method of application is sublime. They’re often quite dewy formulas, combining BB creams or tint with skincare, and I find myself reaching for them far more often than any other foundation or base in my collection. Obviously some are better than others (eg the L’Oreal one doesn’t hold a torch!) and I really love my Hera UV Mist (review + try on here) or best-selling Korean cushion the IOPE Air cushion (review here) for a plump, dewy finish. Dry to normal skins won’t need to powder and can embrace the beautiful finish they give. Combo to slightly oilier skins should definitely try the Etude House Real Powder cushion (review + try on here), it lasts all day without powder. 6. Of course, finish off your look with highlighter! What’s a radiant face without highlighter? I like a fine and luminous highlight, rather than something too strong or glittery. A really unusual one is the 3CE Shimmer Stick in Peach, it’s really got no discernible shimmer in it at all, but the shade is so enlivening, swept across the cheek. I like to use something like this in a more broad area across my cheek and then just top off the very high points with a more glimmery highlighter and I’m absolutely loving the Light Bright pen from Touch in Sol, it’s so pretty. 7. Top things up with a luminous mist. Especially if you’ve used powder, spritzing on a luminous facial mist throughout the day can really refresh things and bring more hydration and light to your face. I like something with a little bit of oil mixed through it, like the Luminous Real Radiance Mist from The Saem (read more about it in this post) for it’s super lovely ingredients – it’s one of my very favourites. While I’m away in Ibiza I have some guest bloggers posting for me, make sure you check back tomorrow for another post!